Fling yourself into the fun of snowy outdoor games and cosy nights indoors. 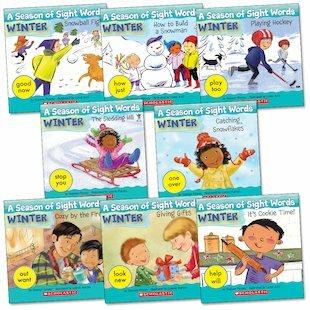 Master essential sight words with a set of gorgeous books which celebrate wintertime. Each very short book tells a delightful seasonal story which helps you practise two important high-frequency words you’ll need for everyday reading. As you spot each word in different kinds of places, you can learn what it looks like and exactly how it can be used. Christmassy fun for all you little learners!